The Lava Beds National Monument is a must see experience when traveling to the greater Butte Valley. An enormous shield volcano has created a widely diverse landscape with over 700 lava tube caves. Many of these caves are conveniently exploreable. Visitors are presented with impressive geological formations, Native American rock art, historical battlefields and a unique rugged high desert wilderness. During the Modoc Indian War (1872-1873), the Indians, led by Captain Jack, used the lava tubes as a fortress. A mere 53 Modoc Indians held off over 500 U.S. Army troops for over 5 months. Plan to spend a good day to capture the areas rugged beauty. A Visitor’s Center provides history and orientation. All listed sites can be seen from the road or by taking a short hike. For more information about the Lava Beds National Monument, call 530-667-8100 or visit www.nps.gov/labe. Mt. Shasta to the south ejects lava as solid blocks or as a plastic material that accumulates at its summit which gives the mountain its great height. Medicine Lake. Photo by Steve Lewis. Medicine Lake Highlands is a SHIELD VOLCANO so vast that it was not recognized as a volcano by the early Europeans who named it. Lava flows from it in a very liquid state giving it a low profile similar to Hawaiian type volcanoes. A trip into this largely uninhabited forested land will reveal recent lava flows and wondrous rock formations. Medicine Lake Volcano is located in the Medicine Lake Highlands Caldera. A caldera is a crater more than a mile across. This calderas is 4 1/2 miles wide and 6 1/2 miles long. The lake at an elevation of 6,700 feet is over 120 feet deep in the area of the collapsed done. 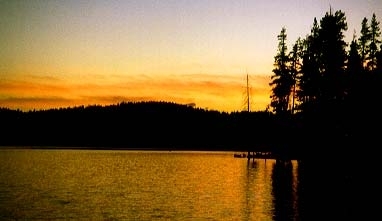 The lake offers camping, swimming, picnicking, and fishing. Drinking water and pit toilets are available. During the summer months a USFS ranger station is open at the west end of the lake. The medicine Lake Highlands if reached by Red Rock Road from Macdoel which is located on U.S. Highway 97. There are NO SERVICES after leaving Macdoel, so plan on being self sufficient until you return to a town. A rhyolite, pumice and obsidian lava flow about 11,000 years old. The obsidian found here is not suitable for projectile points because of extensive crystaubolite content that causes it to flake erratically. Obsidian removal is controlled by the U.S. Forest Service. Check with the Goosenest Ranger Station on Highway 97 just south of Macdoel for details. It is suggested that you also pick up Forest Service maps of the area from this location. Glass Mountain is a volcano whose last eruption happened around 1000 years ago. The mountain stands almost bare of tree or plant life and looks like a shining glass mound rising from the earth. A cinder cone. A steep, narrow road best suited for four wheel drive vehicles leads to the summit. Passenger cars are not recommended. At the deep pot holes near the summit, take the left road and loop clockwise. There is a spectacular view of nearby volcanic areas and nearby mountains. To the east is the Medicine Lake caldera. To the west is the Little Glass Mountain and Pumice Stone Mountain. Three major volcanoes of the Cascade range can be seen. To the east is Mount Lassen at elevation 10,457 feet; to the west is Mount Shasta at elevation 14,161 feet; and to the northwest is Mount McLoughlin at elevation 9,494 feet. The 18,425 acre Butte Valley National Grassland was dedicated in July 1991 and became the nation’s 21st National Grassland preserve. The Grassland is adjacent to the Westside of Hwy 97 between Macdoel and the City of Dorris. Many different species of mammals and birds reside here including antelope and quail. A mix of shallow freshwater marshes, open water, grass, sagebrush uplands and farmlands describes this wildlife refuge. A marked 10 mile graveled auto-tour allows visitors year round access to great wildlife and waterfowl viewing opportunities. This area plays host to one of the country’s greatest flyways. There are a number of photo blinds that are strategically situated for early morning photography. Reserve these blinds at the Tulelake National Wildlife Refuge Visitor Center on Hill Rd. Take Hwy 161 (Stateline) off of Hwy 97 just north of the City of Dorris. Many bird watching sites occur along the highway with the tour entrance itself approximately 9.8 miles east of Hwy 97. Be sure to pull well of the highway for safety’s sake.